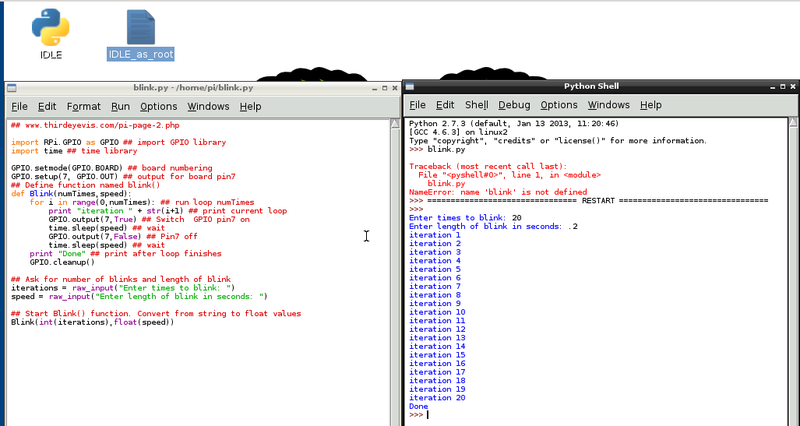 The GPIO functions of the Pi require root priviledges, hence, use sudo to create (sudo vi) and execute (sudo python blink.py) the Python programs. 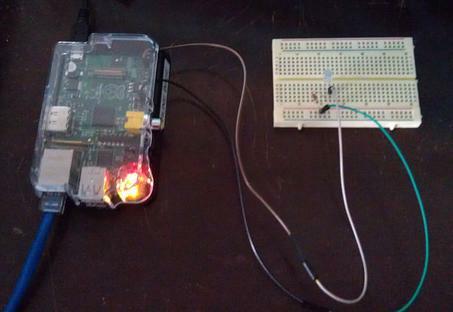 Step 1, test a circuit on a breadboard with a single LED and a current-limiting resistor, using pin 1 from the Raspberry Pi header, which is 3.3 volts, and pin 25, which is GND. I’m using wires connected directly to the GPIO header pins which run to the breadboard. The next issue is understanding the labels of the pins. It isn’t as simple as I would like it. First there are the board-level numbers (standard for headers?). There are a total of 26 pins in two rows. The last line in the second program deals with the error message reported to the console: "pin7-on.py:3: RuntimeWarning: This channel is already in use, continuing anyway. Use GPIO.setwarnings(False) to disable warnings." The warning is cleaned up if the GPIO.cleanup() command is used at the end of a program. BUT, the command cannot be used to end the program to turn on the LED. The cleanup command closes down the output, making the LED not stay on. I couldn’t even see that it had flashed on at all. The second way to number the pins is with the assignment used by the driver chip from Broadcom. 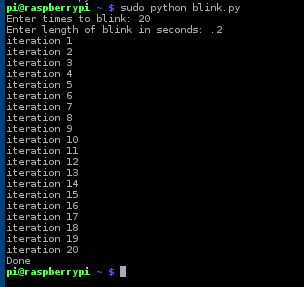 A more exciting Blink program, using Board numbers. My board is a revision 2.0 which I can identify using the console command cat /proc/cpuinfo. All of the above has been explored using ssh to connect to the Pi. Tightvncserver has been set up on it (run manually) to let me log in remotely with a GUI. "blueberr" is the password because only 8 chars are allowed for a vnc password. vncpasswd is the command to type to enter the password if I need to change it (I did!) There is no need to remember the old one. Typically, I need to type sudo python progname.py to get a program to execute. It isn’t that much easier, I know.